FEW streets in Scotland receive the kind of footfall that descends on Edinburgh’s Grassmarket every summer. Between the controlled chaos of the festival and the normal influx of tourists, the historic street is never short of visitors. And so it’s probably safe to say that Signature Pub Group, the independent operator with more than 20 units across Scotland, won’t be short of passing trade for its newest venture this summer. Cold Town House, located in the refurbished former Robertson Memorial Church on the Grassmarket, opened its doors in February. The three-floor, 320-capacity venue is the result of a £4 million investment from Signature and contains its own brewery (the venue takes its name from Signature’s Cold Town beer brand) as well as a rooftop terrace which sits in the shadow of Edinburgh Castle. It is, in the words of general manager Dave Race, “a mix of things for different people”. 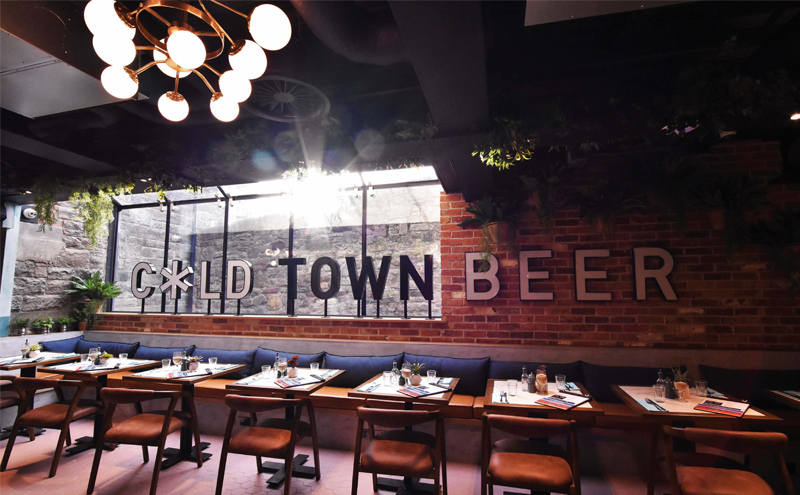 The offer includes an extensive list of craft beers – in addition to the 14 on draught there are around 25 packaged beers in the bar’s fridges – as well as a 14-strong cocktail list and a selection of wines and Proseccos. The ground floor bar and restaurant includes a stage for live music or entertainment, while the first floor ‘pizza and Prosecco’ bar features a custom-built pizza oven shipped from Naples. The first floor is also home to the brewery, with eight 50-litre beer tanks visible behind floor to ceiling windows. The venue’s crown jewel, however, is its top floor. 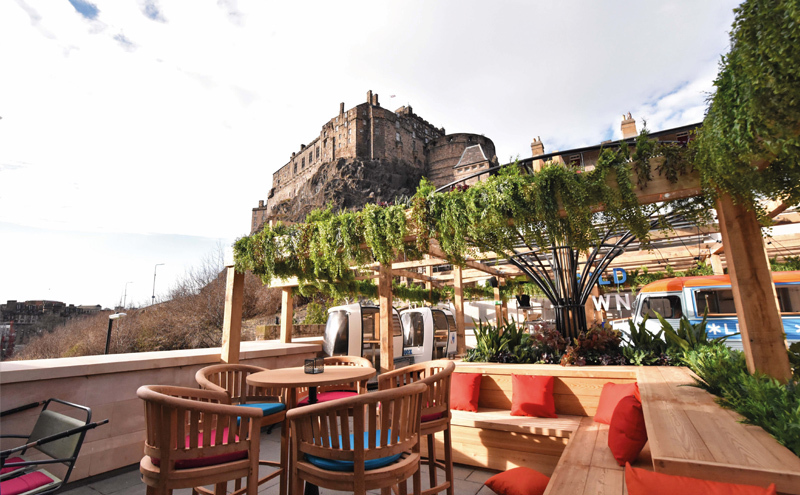 The rooftop terrace has its own bar, in the form of a converted Citroen van, which has two draught taps and a small selection of wines, with a machine dispensing frozen Margaritas and Daiquiris due to be installed in time for summer. A retractable roof is also to be installed over a section of the space, with two former ski gondolas already in place as booths. “One of the most exciting things about this [place], is that it is a different experience for the same person three, four, six times that they come,” said Race. “They can come for a party on a Saturday night with a band playing, jumping around with their mates sloshing beer everywhere, come in with a date the next week and be sat upstairs in the pizza and Prosecco bar watching guys make pizza. “They can be sat up the back the following week with six mates doing a beer tasting in front of the brewery, and come back the following week and be on the roof in the sunshine drinking a slushie cocktail. The variety of different spaces and the breadth of the offer in the venue means the 54-strong team has to be adaptable, able to work in different parts of the venue and switch between bar and table service depending on the occasion. “They’re all capable of jumping from one to the other, which is important for a big venue like this,” said Race. The customers, too, are likely to be a varied bunch. 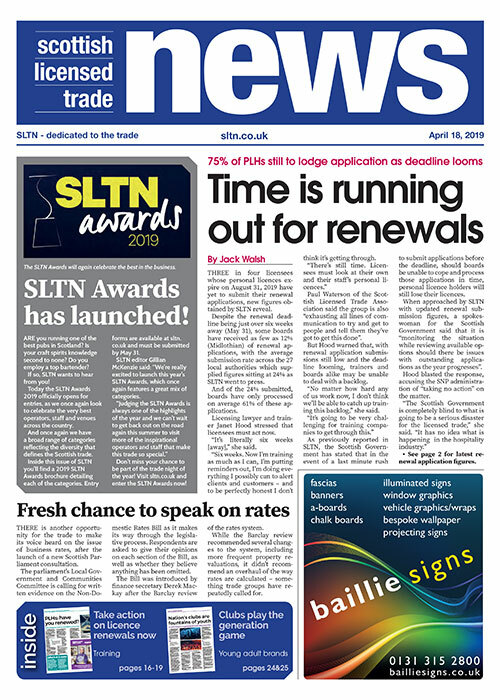 While the Grassmarket has long been popular with visitors to the city, and Cold Town House is bound to welcome its fair share of tourists, Signature is also hoping the unit will prove popular with Edinburgh locals, and the company is making an effort to position the venue as more family-friendly than its neighbours. “The design of the venue is all about doing something on the Grassmarket that isn’t a Grassmarket bar,” said Race. “How do you get people that live in Edinburgh and love Edinburgh and are proud of its food and drink scene to come to the Grassmarket?